The swans are back for the season. The first few swans have been seen at the lake as of 11/2015. Arkansas is the natural state, but we have some unnatural visitors every year in late November. Every winter, Heber Springs is chosen to be a winter vacation home for trumpeter swans. Trumpeter swans are massive, 30 lb birds with up to 8-foot wingspans. They are the largest waterfowl species native to North America. Adult birds are solid white, except for their beaks and feet, and they make a very distinctive sound. Normally, these guys live in the Midwest, Alaska and even Wyoming, but never as far South as Arkansas. For some reason, like many vacationers and retirees, this certain group of swans has chosen Heber Springs and returns there every year. The phenomenon started when 3 swans showed up on the lake in the winter of 1991. It's believed these guys were the "pilgrims" of the current Magness swans. The following winter a Minnesota swan that had been banded visited the lake with her mate. In 1993, that same swan was spotted with her mate and three cygnets (baby swans). Since then, the numbers have fluctuated, but upwards of 150 swans have been spotted on the lake at one time. It's believed the original 3 got knocked off course by a storm. They must have liked what they found, because they came again . . . and brought their friends and family. We will never be sure what brought them so far south. 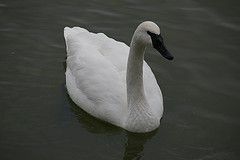 You can read more on their history and the conservation of the swans from the Trumpeter Swan Society. If you want to see the swans yourself, just head out to Heber Springs in late November - early March. They don't really call ahead for reservations or announce their plans ahead of time, so you just have to keep your ears open to see when they're in town. You can view the swans from a public road, with parking space available in an S curve of the road. Shelled corn is the only recommended feed and you can buy feed in town at some of the shops. There's a fence between you and the lake, but the view is great. The swans are best seen in the mid-afternoon to dusk hours. There are always swans on the lake, the mid-afternoon is when some are likely to be in flight. During the earlier parts of the day, they are sometimes off looking for food. The wanderers fly back at around 3-4 p.m.
All ages of swans can be found on the lake. The birds with more gray or brownish feathers are younger birds. They get more white as they get older. Please be mindful of private property and the environment if you make a trip. Canada geese, mallards and other ducks and some domestic geese also share the land. We want to preserve the land for all of them. As it says above, shelled corn is the only recommended feed. It's illegal to harm, kill or injure a swan in Arkansas, so look but don't touch.